← Jemison Astronautics: Sacrifice. Audacity. Success. Forfeit an agenda: Rez up to 3 pieces of ice, lowering the cost of each by 2credit for each printed agenda point on the forfeited agenda. The Corp, playing Jemison Astronautics, uses Quarantine System to forfeit a Hostile Takeover. What is the exact order of operations, and how much discount does the Corp receive for rezzing an Asteroid Belt? The trigger for Jemison Astronautics is the forfeiting of the agenda. As this is a chain reaction, Jemison must resolve before Quarantine System, so the Corp places 2 advancement tokens on a card, which can be placed on Asteroid Belt. Then, Quarantine System resolves and rezzes one piece of ice at a time. If the Asteroid Belt receives the advancement tokens from Jemison, then the total rez cost of the Asteroid Belt is 1: 9 printed rez cost, 6 discounted for having 2 advancement tokens, and 2 discounted for the printed agenda point on the forfeited Hostile Takeover. If the Corp forfeits a card that becomes an agenda for Quarantine System, such as "Clones are not People", how much is the discount for rezzing the ice? The rez cost of the three pieces of ice will not be lowered by any amount, as cards that are turned into agendas do not have any agenda points printed on them. This is essentially a support card for Jemison Astronautics: Sacrifice. Audacity. Success.. Without Jemison the cost of forfeiting an agenda is absurdly high as it massively delays your victory. With Jemison that same cost becomes the prime benefit of Quarantine System. If you don't understand this, please read up on Jemison Astronautics: Sacrifice. Audacity. Success. first. I'm going to review this card assuming you use it with Jemison. Looking at the basic numbers it's 1 to rez, which is easy. 3 is a problem since Quarantine System is the most reliable way to trash agenda's (see my review under Jemison Astronautics: Sacrifice. Audacity. Success. for more details), though to be fair even if it was 5 it wouldn't matter much, this is a card that the runner is gunning for or going to leave alone, not one that will be opportunistically trashed. At 4 influence Quarantine System is not going to see play outside of Weyland, but due to being tied to Jemison it wouldn't be anyway. 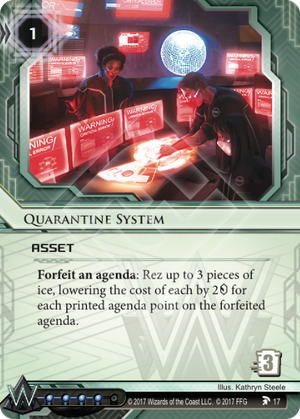 Since Quarantine System is an non-unique agenda it's not vulnerable to Rumor Mill, since it only makes sense to rez on your turn Interdiction is also not a problem. Employee Strike is a major issue, but that's a problem with Jemison rather than Quarantine System. An important thing to note with Quarantine System is that, as I understand the relevant ruling, you do not have the option to rez 0 pieces of ice, it's 1-3. If you would rez 0 pieces of ice the effect wouldn't change the game state. This means you need to have ice available to rez and be able to rez it with the discount applied. So what ice works well with Quarantine System. Unlike the more limited but otherwise similar effect of Haas-Bioroid: Architects of Tomorrow the list is kind of long. Still, there are a few highlights. Fire Wall goes from 5 to 1, almost free. Spiderweb goes from 4 to free. This is especially interesting if the runner's breakers aren't efficient at multi-sub ice. E.g. it's 3 to break with Corroder. Errand Boy is similar to Spiderweb in cost and number of subroutines except it doesn't end the run. It is however something the runner may be inclined to just run through (Chief Slee alert). Lotus Field goes from 5 to 1 and is a solid card against Parasite based ice destruction (though 1 influence). Cell Portal goes from 5 to 1. It's a bit expensive on the influence side (2 to splash) but as it derezzes after the runner has let the sub fire once (and at strength 7 that's likely) it's somewhat reusable. Space ice (Asteroid Belt, Wormhole, Nebula, Orion) can become cheap enough if you're willing to put one or two (Orion) counters on them first. Assassin goes from 7 to 3 and is pretty taxing (though no end the run). Hive has an interesting (read: janky) interaction possibility where you can forfeit an agenda before the runner encounters it to give it more subs. Archer goes from 4 to 0 and triggers another agenda forfeit. That means you can use it with Jemison to "merge" agenda's. I doubt it's useful in practice but if you're going for jank it's theoretically possible to merge 2 Mergers and in combination with Oberth Protocol score a Government Takeover from hand. Wall of Static goes from 3 to 1 and is just good enough to be a minor roadblock (2 to break with Corroder). Bailiff goes from 2 to free and can be useful as a bit of drip economy. Builder goes from 2 to free and can be useful if you have a lot of ice that gains from being advanced (e.g. Mausolus, Ice Wall). Ice Wall goes from 1 to free and is good for making Temüjin Contract a bit less efficient. Also it plays well with Superior Cyberwalls for econ, though I'm not sure that's really worthwhile. Chimera will soon cycle out but has the advantage that it's derezzed at the end of your turn so you can use it over and over again. At 2 it becomes free to rez. Whatever you choose though it's important to protect Quarantine System itself as any savvy runner will try to trash it. There are ways to compensate, mainly including 3 Quarantine System and 3 Oberth Protocol for emergency forfeiting, but it's still a major threat to your game plan. All in all Quarantine System is an important part of any Jemison Astronautics: Sacrifice. Audacity. Success. deck but unlikely to see play outside that particular identity.